Objectives (two vols: The Affective Domain & The Cognitive Domain). New York. David McKay. 1. Knowledge- Knowledge is defined as the remembering of previously learned material. This may involve the recall of a wide range of material, from specific facts to complete theories, but all that is required is the bringing to mind of the appropriate information. Knowledge represents the lowest level of learning outcomes in the cognitive domain. Illustrative Verbs for Stating Specific Learning Outcomes Converts, defends, distinguishes, estimates, explains, extends, generalises, gives examples, infers, paraphrases, predicts, rewrites, summarizes. Illustrative General Instructional Objectives Recognises unstated assumptions. Recognises logical fallacies in reasoning. Distinguishes between facts and inferences. Evaluates the relevancy of data. Analyses the organisational structure of a work (art, music, writing). 5. Synthesis- Synthesis refers to the ability to put parts together to form a new whole. This may involve the production of a unique communication (theme or speech), a plan of operations (research proposal), or a set of abstract relations (scheme for classifying information). Learning outcomes in this area stress creative behaviours, with major emphasis on the formulation of new patterns and structures. 6. Evaluation- Evaluation is concerned with the ability to juge the value of material (statement, novel, poem, research report) for a given purpose. The judgements are to be based on definite criteria. These may be internal criteria (organisation) or external criteria (relevance and purpose) and the student may determine the criteria or be given them. Learning outcomes in this area are highest in the cognitive hierarchy because they contain elements of all of the other categories, plus value judgements based on clearly defined criteria. Illustrative General Instructional Objectives Judges the consistency of written material. Judges the adequacy with which conclusions are supported by data. Judges the value of a work (art, music, writing) by using internal criteria. Judges the value of a work (art, music, writing) by use of external standards. 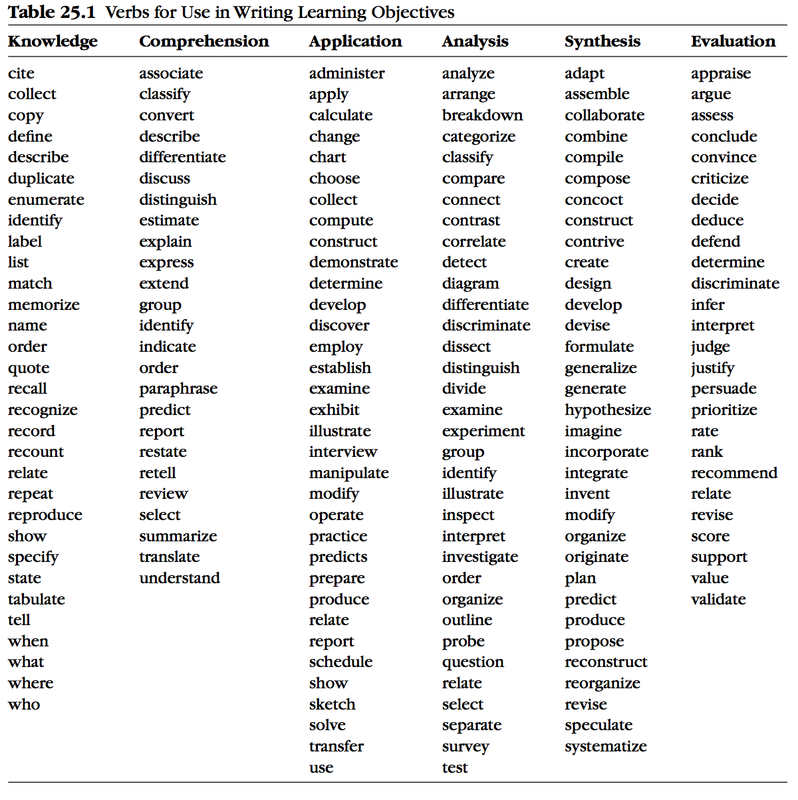 Illustrative Verbs for Stating Specific Learning Outcomes Appraises, compares, concludes, contrasts, criticises, describes, discriminates, explains, justifies, interprets, relates, summarises, supports. 2.Comprehension: classify, describe, discuss, explain, express, identify, indicate, locate, recognize, report, restate, review, select, translate. 3.Application: apply, choose, demonstrate, dramatize, employ, illustrate, interpret, operate, practice, schedule, sketch, solve, use, write. 4.Analysis: analyze, appraise, calculate, categorize, compare, contrast, criticize, differentiate, discriminate, distinguish, examine, experiment, question, test. 5.Synthesis: arrange, assemble, collect, compose, construct, create, design, develop, formulate, manage, organize, plan, prepare, propose, set up, write. 6.Evaluation: appraise, argue, assess, attach, choose compare, defend estimate, judge, predict, rate, core, select, support, value, evaluate.